1968 - Born in Bangalore. 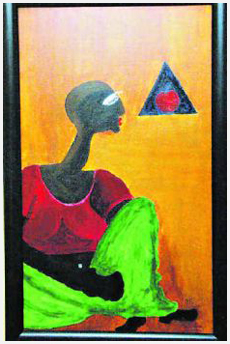 1985-90 - Diploma in Painting under R. M. Hadapad and J. M. S. Mani at Ken School of Art, Bangalore. 1988 - Participated in Workshop organised by Sheela Gowda, conducted by B. V. Suresh and funded by Inlaks Foundation at Ken School of Art, which influenced the direction of his visual language. 1990 - Awarded a one year fellowship to work in Kanoria Centre of Art, Ahmedabad. 1991-92 - Continued to work at Kanoria Centre, where he interacted with fellow artists - Walter D'Souza, Manisha Parekh, Owaiz Husain being some. 1993 - Participated in a group show, along with Om Prakash, Owaiz Husain and Giridhar Gowd titled "Four Young Contemporaries" at Cymroza Art Gallery, Bombay. This show was specially curated by Rekha Rodwittiya. This exhibition was later shown in Sakshi Gallery, Bangalore. 1993 - Granted Inlaks Fine Arts Award. - At present working in Bangalore.